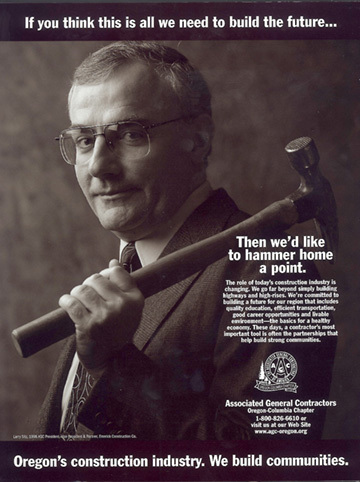 I had an assignment from a client who wanted to shoot an ad that used the size comparison of two heads with hard hats to illustrate the point. 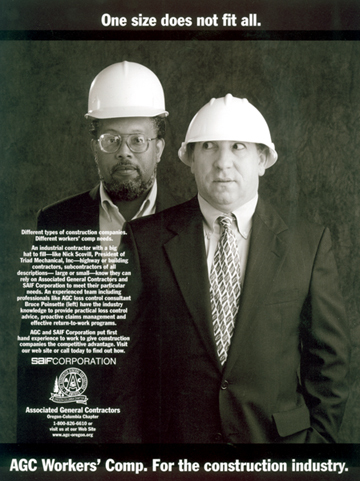 The client brought two employees of the company to model and several different sized hard hats. I set up a large canvas background that had a splatter texture to it and was a blueish grey. It converted to B&W nicely. The number one problem for this shot was making sure that the front model did not cast a shadow on the rear model and one light box or umbrella would have created that. So the solution is to use a much bigger light source and I chose one extra large light box. This not only side lit the front guy but also the rear guy as the light box was large enough to be to the side of each of them. For fill I used a large foam core panel to bounce light back in. A second light box was placed a 10:00 and placed an edge light on the rear model and slightly on the front model. This was only to provide separation between the two models. The distance from background to subject was a consideration as well. I wanted enough separation for obvious reasons like separation, but I wanted it subtle. Instead of lighting it separately , I chose to let the large key light it instead. This will work and is the opposite of trying to key shadows and light spillage form the key light off the background. Here you want it to spill on the background and the reason is because it is dark and we want it lighter. This is unlike a subtle grey background for a business head shot where key light spillage on the background ruins the shot. In this case I tested the shot with the clients as stand-ins prior to models arriving. I had them move back and forth closer and further from the background, moving the key light as well until we had the right spillage lightening the background. The final step was for the client to take these hard hats and reduce and enlarge their size in PS so they looked as they do. This assignment was fun and challenging. Here I decided to gradate the background light from the same direction as the key light. The subject is 15’ in front of the background and this allows the background to get even more blurry, something that I think adds tremendously to a photo. I used a large light box on the background and on camera left and I feathered until I liked the gradation from left to right. I then placed a large light box at 9:00 o’clock camera left and hitting him straight on.